Web application attacks are the #1 source of data breaches. A Web Application Firewall (WAF) provides critical security controls to protect web apps. However, not all WAF solutions are the same. While many can help an organisation protect their apps from common and known threats, most are inadequate against the myriad of attacks across the evolving risk landscape. By watching this webinar, your personal details will be shared with F5 and treated in accordance with the F5 Privacy Notice (https://f5.com/about-us/policies/privacy-policy). You also are signing up to be contacted about F5 products and services but you can unsubscribe at any time. • eine proaktive Strategie zum Schutz von Anwendungen über mehrere Clouds hinweg entwickeln können. • reale Geschäftsrisiken wie Denial-of-Service, Betrug und Diebstahl geistigen Eigentums bewältigen. • Ihren Mitbewerbern einen Schritt voraus bleiben, indem Sie Skaleneffekte zu Ihrem Vorteil nutzen. Durch Ihre Teilnahme an diesem Webinar werden Ihre persönlichen Daten an F5 weitergegeben und in Übereinstimmung mit den F5-Datenschutzrichtlinien behandelt (https://f5.com/about-us/policies/privacy-policy). Zudem stimmen Sie zu, dass wir Sie zukünftig auch über F5-Produkte und -Dienstleistungen informieren dürfen. Sie können dies natürlich jederzeit widerrufen. Oglądając to webinarium wyrażasz zgodę na przetwarzanie Twoich danych osobowych przez F5 zgodnie z polityką firmy (https://f5.com/about-us/policies/privacy-policy). Wyrażasz również zgodę na otrzymywanie informacji od F5 na temat produktów i rozwiązań firmy z możliwością wycofania zgody w dowolnym momencie. Zvažujete poskytování nebo už poskytujete webové aplikace z Cloudu nebo dokonce z několika různých Cloudů (tj. Mutli-Cloudu)? Chcete mít tyto aplikace chráněné stejným způsobem nehledě na to, odkud jsou poskytovány? • si udržet náskok před konkurencí díky efektivitě a výhod úspor z rozsahu. Sledováním tohoto webináře souhlasíte, že Vaše osobní údaje budou sdíleny s F5 a zpracovávány v souladu se Zásadami o ochraně osobních údajů společnosti F5 (https://f5.com/about-us/policies/privacy-policy). Také souhlasíte, že Vás F5 může kontaktovat ohledně produktů, služeb a budoucích akcí F5, ale s možností se kdykoli odhlásit. En regardant ce webinar, vos données personnelles seront partagées avec F5 et traitées conformément à la politique de confidentialité F5 (https://f5.com/about-us/policies/privacy-policy). Vous recevrez également des communications liés aux produits et services F5, vous pourrez vous désabonner à tout moment. By watching this webinar, your personal details will be shared with F5 and treated in accordance with the F5 Privacy Notice (https://www.f5.com/company/policies/privacy-notice). You also are signing up to be contacted about F5 products and services but you can unsubscribe at any time. Al asistir a este webinar, tus datos personales serán compartidos con F5 y tratados de acuerdo con la Política de Privacidad de F5 (https://f5.com/about-us/policies/privacy-policy). Igualmente, está aceptando recibir información sobre los productos y servicios de F5 pero puede darse de baja en cualquier momento. • получение конкурентного преимущества благодаря так называемой «экономии масштаба». Просматривая этот вебинар вы соглашаетесь с тем, что ваши персональные данные будут переданы и сохранены в F5 в согласно Политики Конфиденциальности компании (F5 Privacy Notice, https://f5.com/about-us/policies/privacy-policy). Вы также соглашаетесь с тем, что вам может направляться информация о продуктах и услугах, предлагаемых F5, от которой, впрочем, можно отписаться в любое время. • способы защиты от плохих ботов без нарушения работы хороших ботов. • Welche Arten von Anwendungsangriffen häufig von Bots ausgeführt werden. • Wie Sie sich gegen schlechte Bots verteidigen können, ohne die guten zu stören. • jak se můžete bránit proti zlým botům, aniž byste zničili ty hodné. The speaker for this webinar is Keiron Shepherd, Senior Specialist Systems Engineer at F5 Networks. Join us for the three-part App Protection Series for a comprehensive data-driven view into how applications are attacked, how organisations feel their impacts, and what defenses are brought to bear. Featuring the most comprehensive analysis of its kind, the webinars offer in-depth illustrations of the most prevalent attacks, predictions of future application security trends, and simple but high impact steps for improving application security. The topic for this webinar, part 3 of the series, is ‘Infrastructure Attacks’. The topic for this webinar, part 2 of the series, is ‘Web App Attacks’. The topic for this webinar, part 1 of the series, is ‘Quantifying the Pain’. F5 security expert discusses the details of the top vulnerability listed in this year's OWASP Top 10 Security Risks: Injection Attacks. Defending against the OWASP Top 10 is one piece of a defence-in-depth strategy that will help you ensure the confidentiality, integrity, and availability of your apps, your data, and your business. Watch the video to learn more about injection attacks and how to guard against them. By watching this video, your personal details will be shared with F5 and treated in accordance with the F5 Privacy Notice (https://www.f5.com/company/policies/privacy-notice). You also are signing up to be contacted about F5 products and services but you can unsubscribe at any time. Traditional network firewalls (Layer 3-4) do a great job preventing outsiders from accessing internal networks. But, these firewalls offer little to no support in the protection of application layer traffic. Today, threat vectors are being introduced at all layers of the network. For example, the Slowloris and HTTP Flood attacks are Layer 7 attacks...a traditional network firewall would never stop these attacks. But, nonetheless, your application would still go down if/when it gets hit by one of these. It's important to defend your network with more than just a traditional Layer 3-4 firewall. That's where a Web Application Firewall (WAF) comes in. In this video, John outlines what a WAF is and why your web application needs one. The F5 Advanced Web Application Firewall (WAF) provides a powerful set of security features that will keep your Web Applications safe from attack. 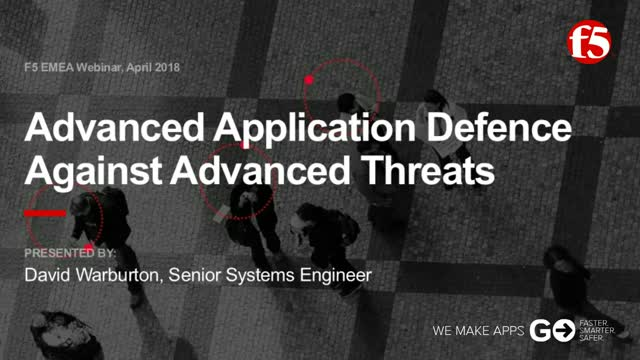 Many WAFs offer a basic level of protection from attack at the higher layers of the OSI stack, but the F5 Advanced WAF takes things even further and offers some serious security features like Anti Bot Mobile SDK, Credential Stuffing threat feeds, Proactive Bot Defense, and Datasafe to name a few. In this video, John outlines many of the exciting features offered in the F5 Advanced WAF. By watching this video, your personal details will be shared with F5 and treated in accordance with the F5 Privacy Notice (https://f5.com/about-us/policies/privacy-policy). You also are signing up to be contacted about F5 products and services but you can unsubscribe at any time. WE MAKE APPS GO. FASTER. SMARTER. SAFER. Our cloud and security solutions offer the freedom to securely deploy any application, anywhere, without sacrificing speed and control. F5 Networks EMEA hosts a new webinar every month in five languages, so stay tuned to this channel. Follow @F5NetworksEMEA on Twitter for more information.